Thais Morata and Erin Haynes at the University of Cincinnati recognize the importance of students having robust science communication skills. So last Fall 2018, they incorporated a Wikipedia writing assignment into their course where students could expand Wikipedia pages about science topics that were interesting to them. The flexible nature of a Wikipedia assignment lets students guide their own research, find topics that they’re interested in, and ultimately make a difference for public knowledge about something they care about. Students are great “translators” of scientific information because they remember what it was like to learn about these complex topics for the first time. A Wikipedia assignment also offers students a great exercise in synthesizing information from a variety of sources. In end of term presentations, students walked through their process for selecting topics to improve on Wikipedia and what they thought of the assignment. The class created and expanded quite a variety of topics by the close of the project. One student set out to find a Wikipedia article that interested him and was also in need of improvements. He began his search at the article about lead. But seeing that it was a Featured Article (Wikipedia’s highest quality designation), he decided it wasn’t a good place to begin editing. He decided to get more specific, looking at the article for lead poisoning. Nope, that was a Good Article (the second highest quality designation on Wikipedia), so he likely couldn’t make a lot of meaningful contributions there. Looking at the “See also” section of the article for even more specialized topics, he found the article for the lead-crime hypothesis. As this student expanded upon in the article, the lead-crime hypothesis is the theory that high lead rates in a community are responsible for high rates of crime in that same community. The theory developed after environmental policies were passed to reduce blood-lead levels in a local population. Children who grew up during the period of reduced lead-levels committed fewer crimes in young adulthood than had previous generations. The lead-crime hypothesis was born to explain the change. Screenshot of the Dashboard’s authorship-highlighting ability. 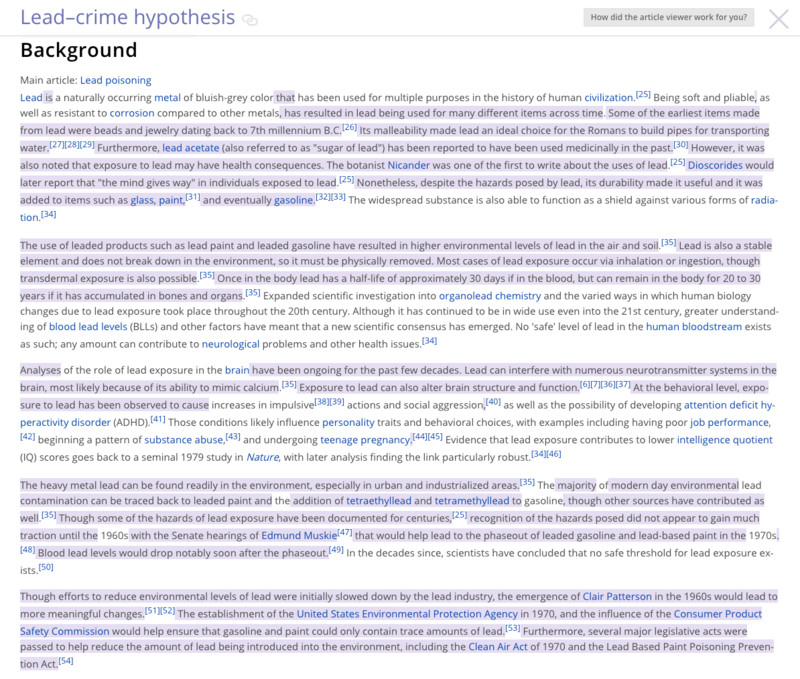 Content that the student added to the lead-hypothesis article appears in purple. Wikipedia is naturally a collaborative space. Volunteers build off each other’s work, expanding upon and deleting previous content when new information comes along. Sometimes students feel intimidated to enter this community space, which has particular norms and expectations about what information makes it into the encyclopedia. But once they get over the initial hurdles of making their first edits, many students find themselves feeling more confident about articulating course topics. And they feel a sense of pride having contributed both to a topic they care about and on a platform where their work can potentially be seen by millions. The student added more than 4,000 words to the existing article about the hypothesis. “A lot of that is improving the background material, expanding on what they’d already said trying to tie everything together,” he shared. He also linked content within the article to other articles, thinking about the topic in the context of the larger fields of sociology and chemistry. Wikipedia writing is inevitably interdisciplinary that way. By the time he was finished adding contributions over the period of the course, the article was deemed well-sourced enough that the warning template that had initially warned readers about flaws in the content could be removed. “Overall, I liked this project. It was something I’d never done before,” he concluded. 2,500 words later, plus a helpful graphic she found on Wikimedia Commons, the article is accessible to Wikipedia’s millions of readers. 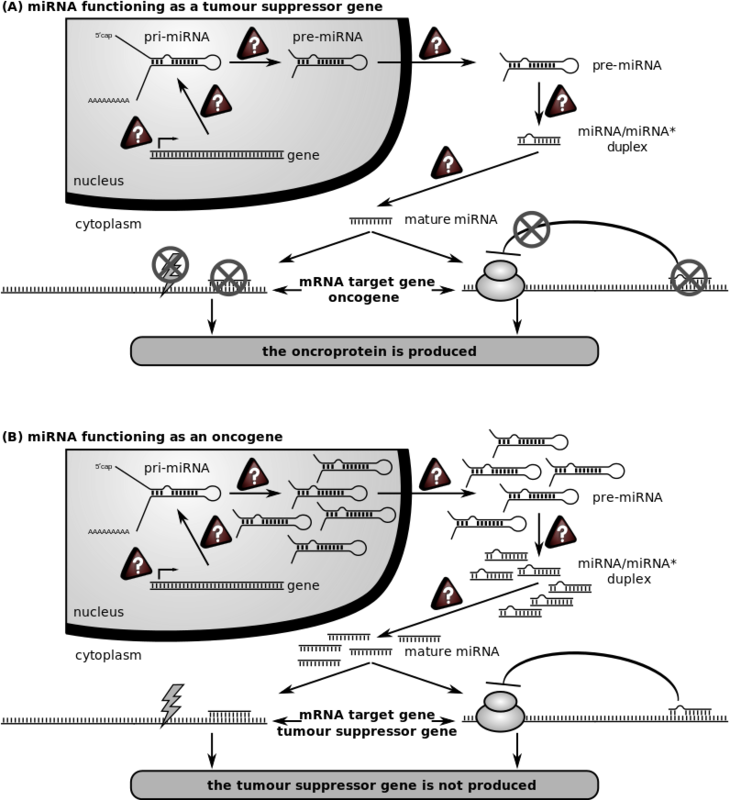 Graphic describing the role of miRNA in a cancer cell. Image: File:Role of miRNA in a cancer cell.svg, Philippe Hupé, CC BY-SA 3.0, via Wikimedia Commons. Wikipedia writing assignments are farther reaching than a traditional assignment, which might just be read by the instructor and filed away. Not only does the act of linking make the article more accessible to the general reader, but it requires critical thinking of the student making the links. Both students thought about their topic within larger frameworks of knowledge. They thought about how it relates to other topics, formed a mental web within their discipline, and thought across that web. Interested in teaching with Wikipedia? Visit teach.wikiedu.org for everything you need to know to incorporate an assignment like this into your course.